The crisis over Crimea could tip the Russian economy into recession this year even without trade sanctions by the West, the World Bank warned Wednesday. The world's 8th largest economy was already slowing rapidly due to a dearth of reforms, and recent events have exposed the weakness of a model based on using oil wealth to fund big projects and pay higher wages, it said in a report. Europe and the U.S. imposed sanctions on several top Russian officials, and one Russian bank, in response to Moscow's annexation of Crimea. They have also warned of tougher measures to come if it destabilizes other parts of Ukraine. Russia's membership of the G8 has been suspended and a summit canceled. Investors have pulled billions out of Russian markets in response to the crisis, and the country's central bank was forced to jack up interest rates and draw on reserves earlier this month to try to stabilize the currency. "Recent events around the Crimea crisis have compounded the lingering confidence problem into a confidence crisis," the World Bank said in a report on the Russian economy. The bank's said its forecast for growth this year depends on how relations with the West unfold, and whether business and consumer confidence can recover. Assuming the Crimea crisis is contained, and resolved peacefully, the economy should continue to grow -- by 1.1% in 2014, down from 1.3% last year. But if tensions escalate, leading to further uncertainty about economic sanctions, the outlook is much bleaker. 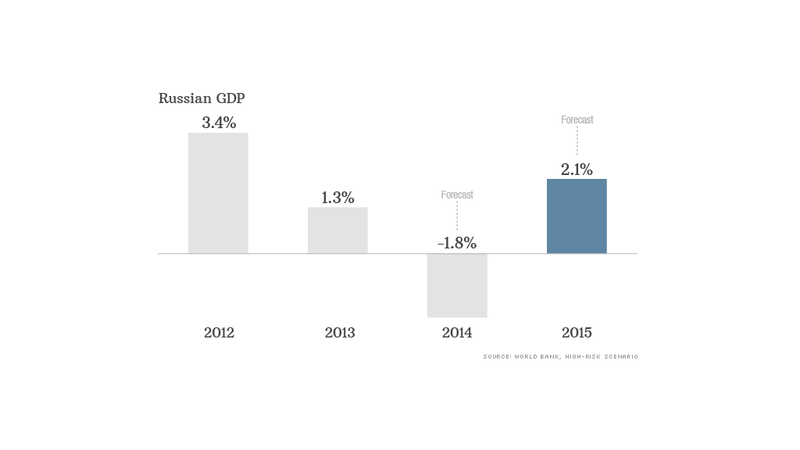 Russian GDP -- worth about $2 trillion -- could shrink by 1.8% this year. "Yet, this scenario assumes that the international community would still refrain from trade sanctions," the World Bank said. Even so, companies and banks would find it increasingly hard to borrow from global markets, leading to reduced investment and higher financing costs, and the flight of foreign capital could intensify. Exchange rate volatility would only add to the risks for Russian companies and foreign investors, it added. Russian stocks and the ruble plunged earlier earlier this month, but both have recovered slightly since as it became clear that Western punishment would be limited to freezing the assets and limiting the travel of some senior officials and a handful of oligarchs. Still, the Moscow stock exchange MICEX index has lost 10% so far this year, compared with a 3% slide on emerging markets more broadly, and the ruble is 8% weaker against the dollar. Inflation is rising sharply as the devaluation makes imports more expensive. And the rising tension with the West is slamming confidence among Russian businesses, wiping out any positive impact from the Sochi Olympics. A monthly survey of about 200 companies in manufacturing, service, construction and agriculture found confidence in March at a 3-month low, with expectations for exports at their lowest level since last August. Production and new orders were also down. "Growth was already extremely weak, with Russia badly needing to change its growth model and rebalance the economy away from consumption to investment. With capital flowing out of the country they've made that job an awful lot harder," said Philip Uglow, chief economist at MNI Indicators.